House, hip-hop, Top 40, mash-ups, and dance. Infinity cabanas, Lounge chairs or daybeds. Bamboo Pool in Las Vegas offers a tropical environment in the midst of a bustling city. Located directly on The Strip, the rooftop oasis emits a private canyon-like feel inspired by Nevada’s desert landscape. 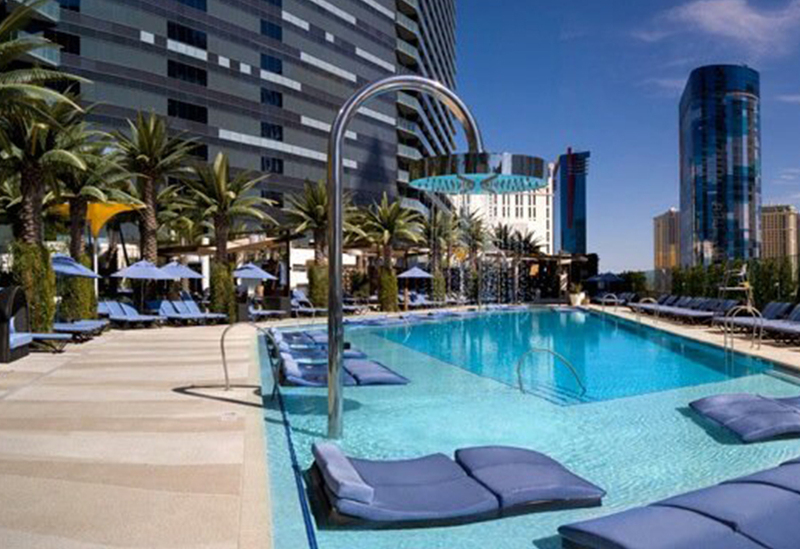 Whether you’re a local who frequents the latest Vegas clubs or a tourist just visiting, a trip to the pool acts as a memorable retreat for those who prefer the finer things in life. Get pampered by the pool, down some drinks with your closest friends, and enjoy the seclusion of the vibrant getaway destination. In short, Bamboo is the ultimate relaxation zone for men and women looking to just de-stress. Located on Level 14 of The Cosmopolitan of Las Vegas, the venue is open daily from 8 AM to 7 PM. However, hours are subject to change depending on unique weather conditions or special events. 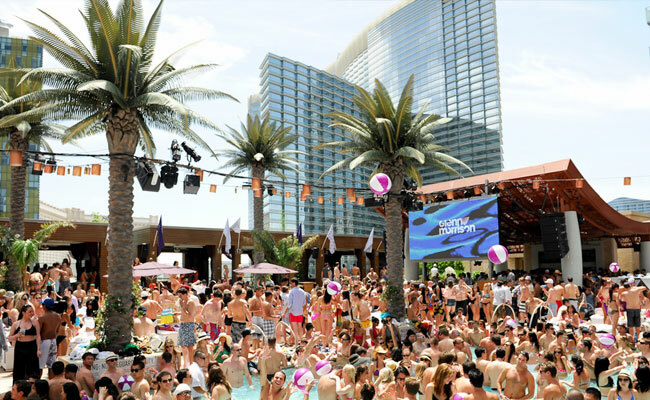 This particular venue can be found within Cosmopolitan’s Pool District, which is conveniently made up of three distinct Las Vegas pools, giving you the best of all three worlds. The three pools in the district include Bamboo, Boulevard and Marquee, and each has its perks. 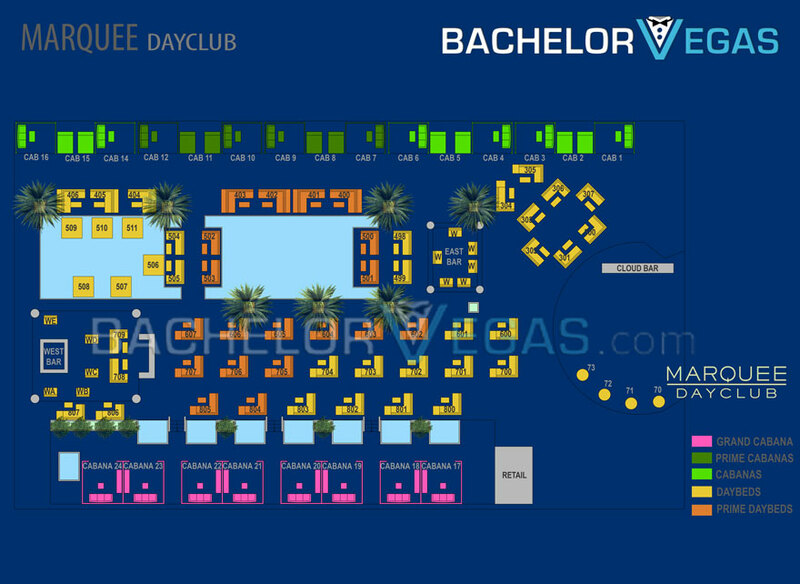 If you want to get away from the craziness of The Strip, head up to the Dayclub for a relaxing day under the Vegas sun. 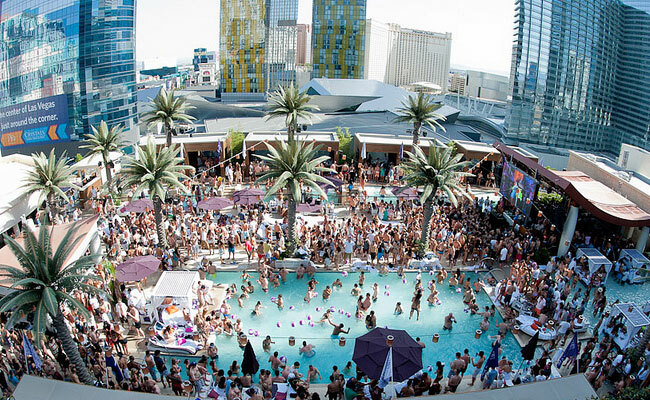 During Las Vegas pool season, all three Cosmopolitan pools are filled with party-goers looking to keep cool while throwing back cold drinks. 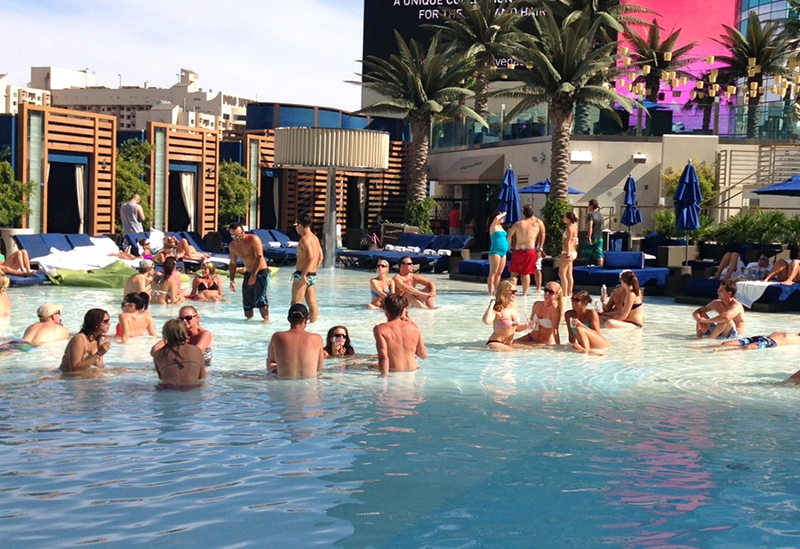 Hanging out at the Dayclub is the perfect precursor to the local nightlife scene. After relaxing and refreshing by the pool all day, head to a local nightclub to dance and party it up. Bamboo Pool can be found adjacent to the spa, and features a wide range of amenities to keep guests relaxed and entertained. The intimate atmosphere is accomplished with a combination of crystal blue pools, towering palm trees, and plenty of seating options. In fact, the venue has 10 private cabanas that surround the pool and are fully-equipped with flat screen televisions, iPod docks, sectional sofas, mini-bars, misters, and ceiling fans. There are also large tulip-shaped umbrellas that provide ample shade, in addition to a misting wall located near the towel service. If you get hungry, you won’t have to go far for a delicious snack. The pool retreat offers a variety of fresh and organic options for upscale poolside dining. Try the popular tapas, salads or iced champagne lollipops. The club is also known for their wide range of specialty cocktails, including the iced mojitos and caipirinhas which are made to order poolside. Beverages can be found at both of the teakwood bars, which are made from colorful glass mosaics which instantly catch the eye. You can find the teakwood bars at either end of the pool area. 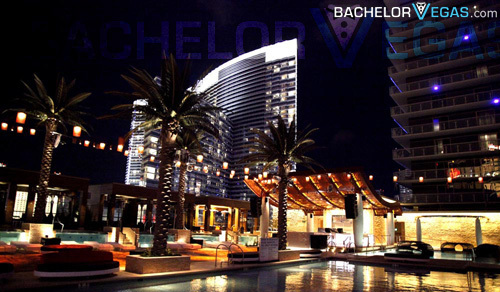 The Cosmopolitan Las Vegas District of Pools offer much more than just a place to swim. 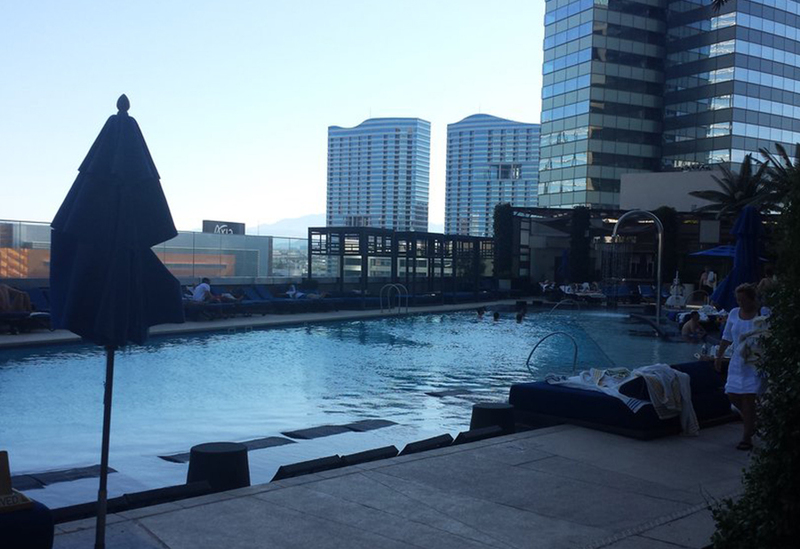 With three separate pool areas, a visit to the hotel is an incredible outdoor experience unlike any other in Vegas. The energy and vibes from the soothing party scene, coupled with the amazing, unobstructed views of the surrounding cityscape, make for an unforgettable trip to the city. If you need an escape from everyday life, a trip to the pool with its lush landscape and high level of seclusion will keep you satisfied. The adults-only club is available for the 21 and over crowd. If you plan to relax on a lounge chair, daybed or in a cabana, be sure to call ahead and reserve your spot, especially if you plan to visit during the weekends when the party really heats up. 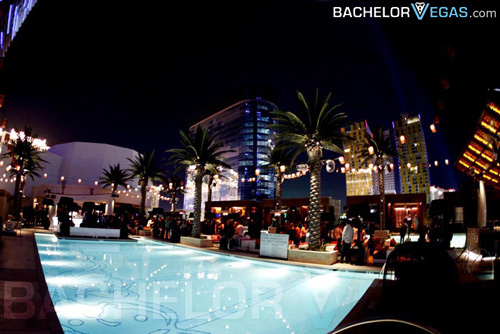 For the best in Las Vegas day clubbing, check out Bamboo.